This collection of writings by one of the leading theorists of Anarcho-Syndicalism, Rudolf Rocker(March 25, 1873 – September 19, 1958), is taken from two of his books, namely Anarcho-Syndicalism: Theory and Practice and his shorter work,Anarchism and Anarcho-Syndicalism. Anarcho-Syndicalism: Theory and Practice was first published in London in 1938. In 1937, Emma Goldman had asked Rocker to write an introduction for the general public on the ideals fuelling the Spanish social revolution that was then in full swing. Within the book, Rocker offered an introduction to anarchist ideas, a history of the international workers’ movement, and an outline of the syndicalist strategies and tactics embraced at the time (direct action, sabotage and the general strike). The chapters from the book on The Objectives of Anarcho-Syndicalism and The Methods of Anarcho-Syndicalism have been included in this collection. In 1946, Rocker wrote an abridged version of the book, entitled Anarchism and Anarcho-Syndicalism. It was published for the first time with the same title in New York in 1948. It consists of slightly revised passages from different parts of the book Anarcho-Syndicalism: Theory and Practice. 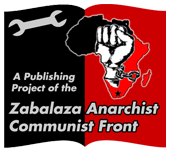 This Zabalaza Books collection includes the chapters from the book on The Role of the Trade Unions: Anarcho-Syndicalist View and The Political Struggle: Anarcho-Syndicalist View. To this day many class struggle anarchists, syndicalists, and leftists of varying traditions gloss over, purposefully or naively Nestor Makhno’s and the historical platformists’ affinity for anarchist unionism or anarcho-syndicalism….